First time posting on the forum. I am about 1 year into my synth/modular journey and I am obsessed and learning something new each day. My first piece of gear was the DFAM which I love followed by a Neutron and a keystep that I pair with it. I have made the jump and just got a mantis case and have a maths, dixie 2+, a-140 adsr, veils, and a passive mult. I plan on getting a wasp filter or a three sisters. My question is really about sequencers...I am torn between a Eloquencer or Rene v2 or a pressure points with brains. Or do I not worry about the sequencer so much right now and go with something like a PNW, adding a plaits and marbles or go with a batumi ahhhh! I bit lost at this point but basically I am trying to create a stand alone unit along with my DFAM. I might sell/trade the neutron because I am not using it as much as I thought I would. Well, you'll probably want more than one sequencer. I know. That's not what you want to hear. I generally lump sequencers into two categories: simple and complex. Think of a simple sequencer as an 8 or 16 step sequencer that can control CV and gate (perhaps just one of the two). The Pittsburgh Modular micro 8 step sequencer, Befacos Muxlicer, Noise Engineering Mimetic Digitalis fit the bill as well as the Sequins mode of Ornaments and Crime. A complex sequencer would be like the Eloquencer, 1010 Music Toolbox, NerdSequencer, etc. Most of them you can save your patterns in and construct entire songs. I would go with a couple of simple sequencers first. If they have the option to be reset/synced, they'll fold nicely into a more complex set-up. The complex sequencer is more about personal preference. With the more complex sequencers you tend to trade off real time controls for depth and the ability to recall your work. Don't be afraid to be wrong. Order from a place that has a great return/exchange policy. A 30 day period is usually good. You don't know what's going to work for you until you've had a chance to get in depth with it. As far as the Neutron, keep it. You'll find it more useful as your system expands. Sometimes you want to just create a sound quickly without a lot of patching. Having an all-in-one synth voice lying around can help with your inspiration rather than trying to patch the equivalent together and losing inspiration. I agree entirely with Ronin's description of sequencers. I use XAOC Tirana II as a simple utility sequencer. Rene2 as an "immediate" sequencer, and I just using NerdSeq as a more "structured" sequencer. They have very different strengths, and it is not a problem to use all of them together. Tirana II is excellent for creating simple gates and CV changes during a patch. I use Rene2 for improvisation and melodies. With the knobs, buttons, and snakes, I find it very immediate and inspiring. I use NerdSeq for more fundamental building blocks of a song: rhythms, melodies, samples. It is less immediate and requires some planning and a more structured approach. Very different machines. It comes down to taste and workflow. Absolutely. Two or three of these simplistic devices coupled with a clock divider, precision adder and a quantizer will generate complex sequences like you never dreamt. Spending a couple dozen hours with those will give you a much more educated idea of what to look for in the big iron. how are you currently playing/sequencing??? 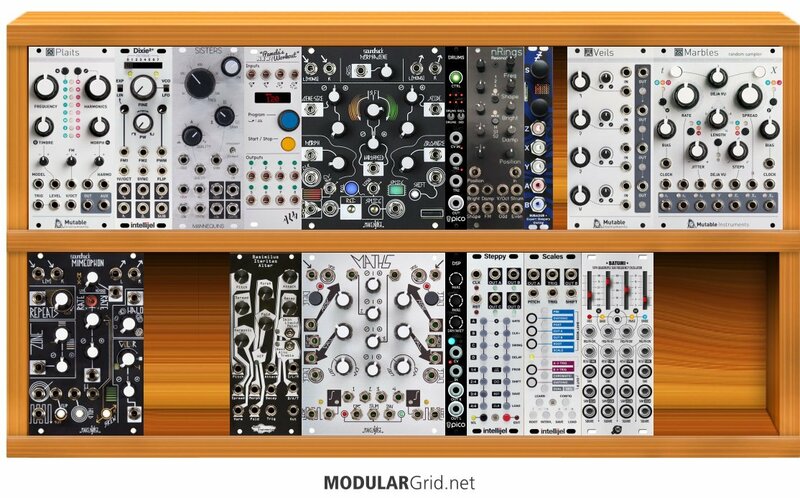 I’ve started to become intrigued by the use of clock dividers, Bernoulli gates, Clocked/CV controlled attenuverters, Logic gates, LFOs, and switched multiples as an alternative to sequencers. Trigger Riot, Klavis Mixwitch and Logica XT, ADDAC gates, Bizmuth, and Pamela’s New Workout, and Branches and two switched multiples all next to each other.